The Bombay Club, located at 815 Connecticut Avenue, NW, one block from the White House, is renowned as a power dining location featuring authentic, gourmet Indian cuisine, and on Sunday from May 1st through May 29th, guests are invited to partake in an exciting culinary adventure exploring dishes from different regions of India. 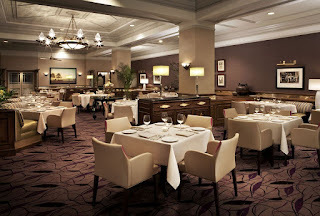 This unique dining experience will be artfully prepared by Executive Chef Nilesh Singhvi, who previously worked for the exclusive Taj Group of Hotels, the leading luxury hotel chain in India. In India, he was afforded the opportunity to work with master chefs of Kashmiri, Avadhi and South Indian cuisines. He served as the main Indian chef of Taj Palace Hotel, New Delhi - a five-star property known for its restaurants, and he was promoted as the executive chef at hotels in Nashik (Maharashtra), and then at Goa and Gwalior (Madhya Pradesh), where he mastered these regional cuisines. Chef Singhvi’s three-course menu will be available exclusively during Sunday brunch service, and will highlight the regions of Goan on Sunday, May 1st, Mughlai on Sunday, May 8th; Hyperabad on Sunday, May 15th, Dehli Punjab on Sunday, May 22nd, and Rajsthan Gujrat on Sunday, May 29th. This culinary journey is priced at $29 per person or $41 for bottomless mimosas and Champagne (excluding tax and gratuity.) This special menu will be available in addition to restaurants regular bottomless brunch menu. To make a reservation, guests can call (202) 659-3727 and visit www.bombayclubdc.com. Located along India’s West Coast along the Arabian Sea, Goa is India’s smallest state by area and fourth smallest state by population. The region is known for its seafood, fresh coconut milk, rice and local spices. Goa has a tropical climate and the cuisine is influenced by its Hindu origins, Portuguese colonialism and modern techniques. Dishes from this region to be showcased include Chicken Cafreal with cilantro, mint, vinegar and black pepper; Semolina Fried Spiced Vegetable Rolls in chilli garlic sauce; Goa Fish Curry with coconut, chili pepper and coriander; Lamb Xacuti with onion, roasted coconut and spices; Vegetable Khot Khotem with lentils, curry leaves and ginger; Cashew Mushroom Xacutti, cashew, peas, shiitake, coconut and cilantro, and Dal, yellow lentils with mustard seeds and curry leaves. For dessert guests can enjoy Tender Coconut Caramel Pudding, and Elaichi Kheer. Mughlai is a style of cooking used in Northern Indian, specifically in the regions of Uttar Pradesh and Delhi. The cuisine is strongly influenced by the Muslim, Persian and Turkic cuisines of West and Central Asia, and has in turn strongly influenced the regional cuisines of Kashmir and the Punjab region. The tastes of Mughlai cuisine can vary from extremely mild to spicy. Dishes have a distinctive aroma and the taste of ground and whole spices. Moghal chefs are known for perfecting an aromatic cream sauce made with ghee, cream, garlic and onions. Menu highlights from this region include Shami Kebab with lamb, caramelized onion and clove; Hara Kebab with spinach, lentils and garam masala; Dum Ki Macchli with fish, roasted gram flour, yogurt and cashew; Dhingri Dulma with shiitake, cottage cheese, fenugreek and saffron; Gosht Biryani with lamb, rice, onion, saffron and garam masala, and Subz Purdah Biryani with vegetables, rice, onion, saffron and garam masala. For dessert guests can enjoy Phirni with rice, milk and pistachio, and Seviyon Ka Muzaffar with vermicelli, milk almonds. Hyderabad is the capital of southern India's Telangana state, and its popular cuisine comprises a broad repertoire of rice, wheat and meat dishes and the skilled use of various spices. Hyderabadi Biryan and Hyderabadi Haleem, with their blend of Mughlai and Arab cuisines, have become iconic dishes of India. Hyderabadi cuisine is highly influenced by Mughlai and to some extent by French, Arabic, Turkish, Iranian and native Telugu and Marathwada cuisines. Dishes from this region to be showcased include Telangana Chicken Roast with onion, tomato, ginger garlic and lime; Cauliflower Bezule with garlic, chili pepper and curry leaves; Fish Mapas with coconut, onion, mustard seeds and fenugreek; Lamb Ishtew with onion, yogurt and fennel; Mirch Baigan Ka Salan with eggplant, jalapeño, sesame, coconut and coriander; Khatti Dal with lentils and tamarind, and Tamarind Rice with lentils, sesame, fenugreek and mustard. For dessert guests can enjoy Khubani Ka Meetha, stewed apricot, and Seviyan Payasam with milk and vermicelli. Dehli-Punjab, located in Northern India, cuisine has influenced the food habits of its residents and is where Mughlai cuisine originated. Along with Indian cuisine, a variety of international cuisines are popular among the residents. The dearth of food habits among the city's residents has created a unique style of cooking which became popular throughout the world, with dishes such as Kebab, Biryani, and Tandoori. The fast living habits of Delhi's people has motivated the growth of street food outlets as well as a trend of dining at local dhabas, roadside restaurants. Menu highlights from this region include Gol Guppa Chat; Dahi Bhalla; Butter Chicken; Lamb Chops Masala; Fish Amritsari; Paneer Lababdar; Sarson Ka Saag; Aloo Gobi; Baingan Bharta; Dal Makhni; Peas Pulao; Tawa Paratha, and Gobi Paratha, Makki Roti. For dessert, guests can enjoy Gulab Jamun, and Gajrela. Rajasthan is culturally rich and has artistic and cultural traditions, which reflect the ancient Indian way of life. Rajasthani-Gujarat cooking was influenced by both the war-like lifestyles of its inhabitants and the availability of ingredients in this arid region. Food that could last for several days and could be eaten without heating was preferred. The scarcity of water and fresh green vegetables also had their effect on the cooking. Menu highlights from this region include Vegetable Khandvi with gram-flour, yogurt, cilantro and coconut; Mirchi Vada with jalapeño, potato and raisins; Laal Maas with lamb, chili, onion, garlic and black cardamom; Safed Murg with chicken, yogurt and cashews; Rajasthani Gatte with gram-flour, yogurt and chili peppers; Oondhiya with beans, plantain, yam and potato; Bhindi Achari with okra, onion, mustard, cumin, fennel and onion seeds; Mangodi Pulao with rice and lentil dumplings, as well as Dal Panchmel with five lentils, onion and tomato. For dessert, guests can enjoy Shrikhand with yogurt and candy sugar; Kesar Badam Kulfi, and Dal Badam Halwa with almond, lentil and sugar. Celebrating 28 years as Washington’s famed power dining location, The Bombay Club has been revered by presidents and the political elite and is named among “The 100 Best Restaurants” by Washingtonian and Eater’s Essential 28 List. It features a beautiful updated décor reminiscent of the old clubs in India. Esteemed guests who have frequented the restaurant included Former President Bill Clinton and Secretary of State Hillary Clinton, Former President George H. W. Bush, President Nelson Mandela and Secretary of State Condoleezza Rice to name a few. From the silver screen, notable stars such as Harrison Ford, Bruce Willis, Demi Moore, Goldie Hawn and Kurt Russell have also been fans of the authentic Indian fare. Since opening The Bombay Club, Ashok Bajaj has added several other highly successful restaurants to his collection in the nation’s capital, including 701, the Oval Room, Ardeo+Bardeo, Rasika, Bibiana Osteria-Enoteca and Rasika West End. For additional information, please call (202) 659-3727 or visit www.bombayclubdc.com.